The Lights at Andover is another very pleasant arts centre in a smaller town, heavily raked auditorium, spacious public areas, nice bar, plentiful loos. 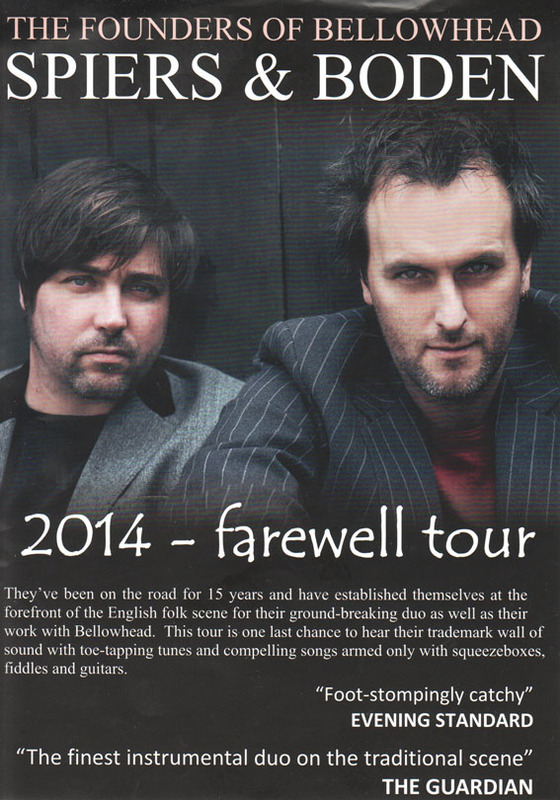 It was the third Spiers & Boden in a year, and sadly the “Farewell Tour” due to the increased work with Bellowhead. We thought it was the best of the three shows too, helped by a pleasant venue, clear sight lines and excellent sound. As I’ve said before they don’t sound like a duo at all … but as Jon Boden is playing violin and using an amplified stompboard, and as John Spiers’ melodeon can add rhythm and melody with a separate set of bass buttons, you’re really getting the sound of four. Compare the set list with New Milton (May 2013) and Poole Quay in June 2013. (BOTH LINKED). While there’s a central core of instrumentals, they ring the changes. They started with the first track from their first album, Rambling Sailor to mark their 15 year journey. I was delighted to get the melodic Courting Too Slow, one of my favourites. The Outlandish Knight is the one I always imagine is called ‘The First Morning of May’ but it’s not, and on Jon Boden’s A Folk Song A Day: May set it comes as number three, but then there are a lot of songs about the first of May. This is so fascinating because the violin part is so original and so innovative throughout. Both of these two have been recorded by both Spiers & Boden and by Bellowhead, so fit this transitional phase, presumably to being just Bellowhead, though John Spiers mentioned some upcoming solo shows too. They each took a solo spot. Jon Boden’s in the first half was We Do What We Can from his solo Songs From The Floodplain, appropriate driving past the remnants of floods along the Test Valley to Andover. He switched to guitar and it was a highspot for us, as the song was in the ten most played on my iTunes list at the end of last year. He is such an able curator of folk songs, that his originals get forgotten. This is a stunning original, in melody, lyric, vocal and execution. Captain Ward was the rousing closer to the first half. After the interval, Adieu Sweet Lovely Nancy opened the second set, another beautiful sweet song. The Three Tunes / Sportsman’s Hornpipe instrumental section is hypnotic, and Sportsman’s Hornpipe with Jon Boden playing his fiddle plucked and horizontal, like finger-picked ukulele is brilliant stuff. Bold Sir Rylas is another personal favourite, with Jon switching to guitar, and John switching to concertina. John Spiers played a gorgeous reflective instrumental as his solo spot, The Dawn Chorus where he made one melodeon sound like an orchestra. He said the tune came from The Mallard aka The Most Beautiful Leg of The Mallard. Tom Padget was followed by the shared-with-Bellowhead Sloe Gin Set with Haul Away closing the main set. They are completely happy to do New York Girls as first encore. Everyone wants it. It’s fantastic. It would be foolish to omit it. The stomping audience wanted a second encore and we got Prickle-Eye Bush. This tour goes right through March and picks up to run right through May. If you like folk, if you like English music, it’s one not to miss. We travelled 55 miles. It was well, well worth it. A wonderful evening.